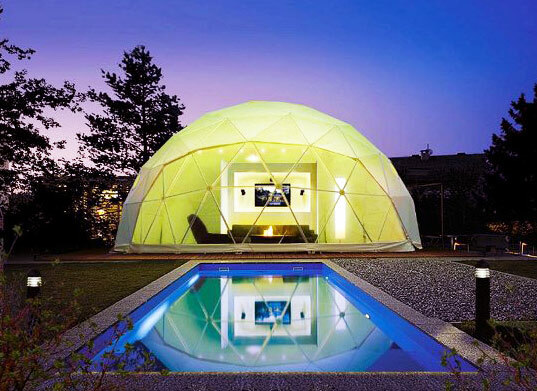 Berlin-based company Zendome develops these innovative, flexible, and stylish dome-like spaces. Thanks to their non-hierarchical geometry, the structures can be set up in a snap in virtually any location. Available in sizes ranging from 30 m2 to 300 m2, Zendomes can be erected in 10% of the construction time of conventional architecture, which makes them perfect for all kinds of indoor and outdoor events. With their high ceilings the larger Zendomes have the characteristics of conventional buildings, however their innovative lightweight construction allows them to save resources while taking into account the growing mobility of people. Single domes can also be combined to form entire Zendome “domescapes”. By using different combinations of simple add-on modules such as round doorways, panoramic windows, membranes and floor-systems, Zendomes can be specially adapted to suit virtually any need. Their geodesic design creates flexible and expansive interior spaces that require a minimal amount of materials. High quality components ensure that each structure has a long lifetime – the primary static substructure of each floor is made from galvanized steel, and the membranes can be made from a synthetic tarp or a transparent textile. Zendome was founded in 2006 and has clients throughout the cultural, media, corporate and governmental sectors. We've just ordered one for our Trade-Fair stand! very exciting concept...the graphics on the dome itself will hopefully also be an eye-catcher to get lots of people to come inside and watch our presentations etc. Zendomes exude quality throughout. What an amazing space to live in ! Long live the dome! With their high ceilings the larger Zendomes have the characteristics of conventional buildings. However their innovative lightweight construction allows them to save resources while taking into account the growing mobility of people. 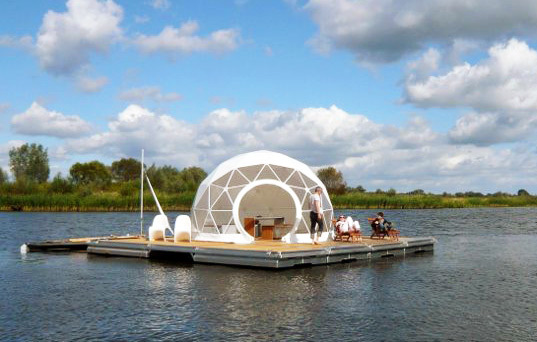 Single domes can also be combined to form entire Zendome "domescapes". By using different combinations of simple add-on modules such as round doorways, panoramic windows, membranes and floor-systems, Zendomes can be specially adapted to suit virtually any need. Their geodesic design creates flexible and expansive interior spaces that require a minimal amount of materials. High quality components ensure that each structure has a long lifetime - the primary static substructure of each floor is made from galvanized steel, and the membranes can be made from a synthetic tarp or a transparent textile.